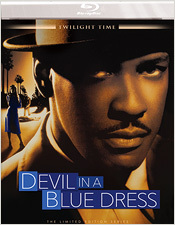 Carl Franklin’s Devil in a Blue Dress (1995) is one of those movies that seemed great when it was initially released and seems even better twenty years later, when its strengths are less frequent than they were at the time. Indeed, watching Franklin’s exquisitely detailed evocation of post-WWII Los Angeles now, one becomes almost unbearably nostalgic – not for the 1940s time period the film recreates, but for the more recent era when studios were still making movies at this level of intelligence at this scale. Devil in the Blue Dress represents the best of two worlds: it has the sophistication and moral complexity of a great indie but the epic sweep of a large-scale studio production. Beautifully executed on every level and profound without being pretentious, it’s one of the unsung American masterpieces of the 1990s. The story, adapted from Walter Mosley’s 1990 novel of the same name, follows Ezekiel “EZ” Rawlins (Denzel Washington), a black veteran who has bought his own home in Los Angeles via the GI bill and seems to be living the American dream – until he’s laid off from his job in the aircraft industry. Worried about how he’s going to pay his mortgage, Rawlins accepts an offer from a shady white guy (Tom Sizemore) who wants him to find the girlfriend of a failed Mayoral candidate. The girlfriend supposedly has a predilection for black men, which is why – allegedly – Rawlins is the right man to look for her, even though he has no experience as a private eye. The investigation that ensues draws Rawlins further and further away from the domestic stability he craves and more and more toward danger as he gets sucked into a confusing, complicated world of political dirty tricks and depressingly human matters of the heart. Superficially, Devil in a Blue Dress resembles other L.A.-based films noir like The Big Sleep, Chinatown, and L.A. Confidential. While the movie stands proudly alongside those classics, it has a unique flavor all its own that comes from Franklin’s razor-sharp specificity in recreating the black neighborhoods of the era; there’s a sense of both promise and foreboding in the dream of upward mobility to which Rawlins aspires, as Franklin perfectly captures a moment in history when black veterans attempted to enjoy the simple pleasures of the society they just finished fighting to protect. There’s a palpable sense of community generated both by the pitch-perfect ensemble cast (which includes Jennifer Beals and Don Cheadle in his breakout role) and the expansive production design by Gary Frutkoff, who packs the frame with one telling detail after another. The movie is visually stunning without seeming like it’s trying too hard – there’s nothing ostentatious about Franklin’s direction, just an unerring sense of what needs to be on screen to give a sense of a fully realized world and philosophy. It’s almost like a documentary – only with the added sense of style and texture that comes from great fiction. Tak Fujimoto’s cinematography is extraordinary, particularly in its seemingly infinite number of gradations of blue, brown, and black. The subtleties of Fujimoto’s palette were largely lost on earlier video incarnations of the film, which tended to pump up the brightness and contrast, but Twilight Time’s new Blu-ray thankfully preserves the cinematographer’s images as they were intended to be seen. I recently saw a pristine 35mm presentation of Devil in a Blue Dress projected in Los Angeles, and I can confidently report that this Blu-ray is just about as good as an archival print – maybe even a little better given the flawless DTS-HD sound mix. Per Twilight Time’s policy, the disc includes an isolated music track, which is a particular treasure here given the iconic score by legendary composer Elmer Bernstein. There’s also a theatrical trailer, Don Cheadle screen test, and a solid (if occasionally redundant) commentary track by writer-director Franklin. In short, it’s a fine package for an excellent, somewhat underrated film.